We’re entering the home stretch on winter here in North America, which means it must be time for the Great Backyard Bird Count! The GBBC is an awesome birding tradition that elevates awareness of February feeder bird distribution, mobilizes a nation of bored citizen scientists into productive action, and brings out the backyard birder in all of us. The 2008 GBBC, scheduled for February 15-18, promises to be the most sophisticated one yet; it even boasts a blog, maintained by our Birdchaser buddy, Rob Fergus. To celebrate the 2008 Great Backyard Bird Count, we at 10,000 Birds are giving away not one, but two copies of the new Audubon Backyard Birdwatch. I think this book is a fantastic resource for backyard birders and want you or that special backyard birder in your life to have a copy. This promotion has two parts, each of which will produce one recipient of a free book from its distinguished publisher, DK. 1. Tell us your favorite backyard bird. Easy, right? All you have to do is leave a comment below or send me (mike AT 10000birds DOT com) an e-mail (put “Most Beloved Backyard Bird” in the header) naming the bird that you most enjoy seeing in your backyard. Feel free to briefly state why you favor that bird over all others. 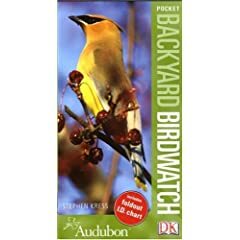 One participant in this promotion, which happens to be open to readers around the world even if the GBBC is not, will be selected randomly to receive a copy of Audubon Backyard Birdwatch. In addition, we’ll count all of the ballots to determine the Most Beloved Backyard Bird 2008, an honor avians didn’t even know they were vying for until today! Since we’re talking about love here and Valentine’s Day conveniently falls on GBBC eve this year, let’s have all votes cast by end of day February 13! 2. Spread the word about this (amazing) promotion. The crown of Most Beloved Backyard Bird 2008 won’t mean much to its recipient if the electorate is undersized! We’d like hundreds, perhaps even thousands of votes to be sure that we’ve accurately identified the avian most endowed with affection by feederwatchers and backyard birders. Link to this promotion on your blog, forum, newsletter, etc. and let me know that you did so and you’ll be in the running for the second copy of Audubon Backyard Birdwatch, also awarded randomly. This act of kindness, alerting others to an opportunity to receive a free copy of a great book, is most appreciated and will undoubtedly be rewarded by the birding deities with a bumper crop of rarities some time soon. So celebrate the coming Great Backyard Bird Count in style by nominating your favorite backyard bird for the title of Most Beloved Backyard Bird 2008 and receive a free copy of Audubon Backyard Birdwatch. This is going to be the best GBBC ever! UPDATE 2/14/08 – The winners of the book giveaway and, more importantly, your choice for Most Beloved Backyard Bird 2008, have been announced! I am looking forward to the GBBC. I don’t know why, but it seems some of the more avid birders I know can’t be bothered with it. Maybe the name is deceptive as one can count birds anywhere. I think they think it is for beginners. Whatever the case I’ve been organizing the troops in the 17241 Zip Code. Last year we 66 species, this year we are shooting for 70 or more! My favorite backyard bird is the White-crowned Sparrow that occasionally frequents the ornamental trees bordering my yard. Alas, I’ll be traveling that weekend and Mr Wren, who will be in sight of the backyard, doesn’t bird. Maybe next year. However, I can vote for our favorite backyard bird. Unfortunately, since we moved my namesake bird, the Carolina Wren, is no longer a backyard visitor. However, we have regular visits in the spring and summer from Sandhill Cranes, so they have my vote. Wonderful, wonderful . . . another contest. Hurrah! My nomination is the Chickadee (in all it’s varieties). (Because unlike Clare, I don’t actually get Ravens in my backyard — at school, yes and in my neighborhood, yes . . . but not in my actual yard. Sigh). To read more about my love of the Chick-chick-chick-a-dee (and to see my promotion of your contest), visit my blog. You guys rock! Since I live in an urban apartment building in Washington, DC, I construe my “backyard” to be the segment of Rock Creek Park starting behind my building and running down to & including the National Zoo. Naturally this gives me an abundance of species from which to choose a favorite. So I’ll go with Pileated woodpecker — I am very fond of all woodpeckers, but the magnificent Pileated is my favorite. I guess I can’t work the Great Auk into this one. My favorite backyard bird is the Red-breasted Nuthatch. Rare enough to be a treat, common enough to be a treat you actually get. And I’m a sucker for the little black mask. I vote for mockingbirds. With a real virtuoso around, it can sound like your yard is full of many birds. One of them here has upwards of a dozen – I lose count. And I love the way they leap into the air, flashing their white-barred wings, never missing a note. Going in true “backyard” style, I choose the American Robin. They just hop around the yard, pause, turn their head back and forth (listening for worms), hop some more, then suddenly snag a juicy nightcrawler out of our beautifully dark and rich Iowa soil (the Natives called this place “beautiful land,” you know ;)). Bonus: in the springtime, Ms. Robin usually does all of the above with a baby in tow, squawking for a piece of every worm! My favorite backyard birds are the Brown Thrashers that occasionally show up at my suet. Such a cool bird close up and a great song that reminds me of summer evenings on the back porch. Awesome, guys. It’s interesting that so far, no bird has emerged from the pack. And N8, I hope you do have the highest dovekie count in the GBBC! I’m a fan of the Palm Warbler. There are so many in Florida right now and I love the way they pump their tails. My vote must go to the Red Breasted Nuthatch. Clown,accrobat, and brave enough to come within inches of me and chip like mad if I’m to slow filling the feeder. Carrie is right, a rare treat. The gbbc is encouraged in our elem school (several of the staff are birders). I have some neighboor children coming and watching in our yard. By far, my favorite has to be my Eastern Bluebirds. They stay with me all winter long and in the spring/summer work hard to fledge sometimes four broods. There is just nothing like bluebird babies flying all about the yard. I could close my eyes and listen to their warbling all day long. I’m promoting the GBBC at my site right now, and didn’t realize you had a “contest” to help others spread the word! Last year was my first year as an official counter, and this year I hope to do even better. Hearing how many are participating in the GBBC in various capacities, some for the first time, is energizing. I guess winter birding isn’t all bad! With Nina’s vote and others I’ve received, the chickadee in its various flavors appears to be gaining ascendancy. Cast your votes quickly, people! My favorite backyard bird is the Gray Catbird. I can’t resist that dapper black cap and raucous, mysterious singing from inside the shrubs. When I was new to bird-watching, my first triumph was identifying a Catbird. My favorite is the Red-Breasted Nuthatch. There are two that have recently been visiting my feeders this winter. It is so tiny and cute. I love it’s sound also! My kids (ages 5 & 3) are very excited about the GBBC. It is our first year and we have just recently started bird watching. We have 3 feeders that have many visitors but our favorite backyard bird is our newest bird friend : a Downy Woodpecker. Affectionately named Woody! He is so much fun to watch and quite cute! Well, I’m surprised no one has voted for the hummingbird, yet. That would be my favorite (aka Anna’s hummingbird here in Calif). It’s such a delight to see these little flying jewels in their beautiful colors. And, oh, they can be feisty at the feeders, too. I love to see such aggession, or is it assertiveness in these small avians. Little but mighty! The Carolina Chickadee is by far my favorite backyard bird. It was in 1976, sitting on the backyard porch of my first home & overlooking the beautiful wooded yard that I spotted that first bird that sparked my lifelong interest in birding. The Carolina Chickadee has since become my “Birding Ambassador”. Each time I hear one, it seems she has always brought a new friend. Time after time, it seems she is accompanied with at least one other interesting feathered friend. I always look up with anticipation at the sound of her Chicka-dee-dee-dee! The others who have commented have great selections, but I’m going with White-breasted Nuthatch since they are such clowns and they hang around (upside-down) all year long for my pleasure. Hey, Mike, thanks for blogging! I really enjoy watching the black-crested titmouse that comes by each morning hoping to beat the wrens to the worms. My favorite backyard bird is the Pileated Woodpecker. They are so dramatic, majestic and strong with their swift movements! I’ve even been dreaming about them! Although in my dreams they are unrealistically large! Second fav is the adorable Black-capped Chickadee because of the unforgettable call and their friendliness. You need a trackback feature. I’ve linked the promotion (finally) on the House. And did I already say… Raven? My favorite back yard bird is the Red-Bellied Woodpecker. I love their colors- their Zebra-backed bars,bright red head, their loud Chiff, Chiff call and their determinedness in getting the seed from the feeders. Winter comes, and winter goes, and with it goes the waxwing. Hurry back to me, my jolie, in la louisiane…(tapping foot, scratching frattior). Well, a catbird keeping its balance atop the slender leader of a neighbour’s spruce made a strong campaign showing, but there is another bird that always takes my breath away. I vote for the (ruby-throated) hummingbird. I’ve linked your promotion back at my place. Favourite? Has to be the little House Wren – always making its presence known whhhenever you step outside. THIS IS A HARD ONE- I LOVE THE GOLDEN CROWNED SPARROWS BUT ALSO THE TOWHEES-PERHAPS MY VERY FAVORITE ARE THE STELLAR JAYS- IF I AM NOT OUT AT A CERTAIN TIME IN THE AM. THEY SIT ON THE FENCE AND SQUAWK TO LET ME KNOW WHAT IS MISSING!